Anyone who knows me will tell you that I have what could be described as a ‘slightly’ irrational fear of East London. It all stems back to two incidents almost a decade ago, one where I was stupid enough to wear heels on New Year’s Eve in Hoxton, sprained my ankle on the way there and spent the evening sat with my foot in a bucket of ice whilst people talked over my head and the second being a rather nasty “you’re not cool enough to be here” type slur in a bar that shall remain nameless. The upshot was that I was left thinking, sod you East London, you’re a devil to get to from South West London anyway and London’s a big old place with plenty to do and see. 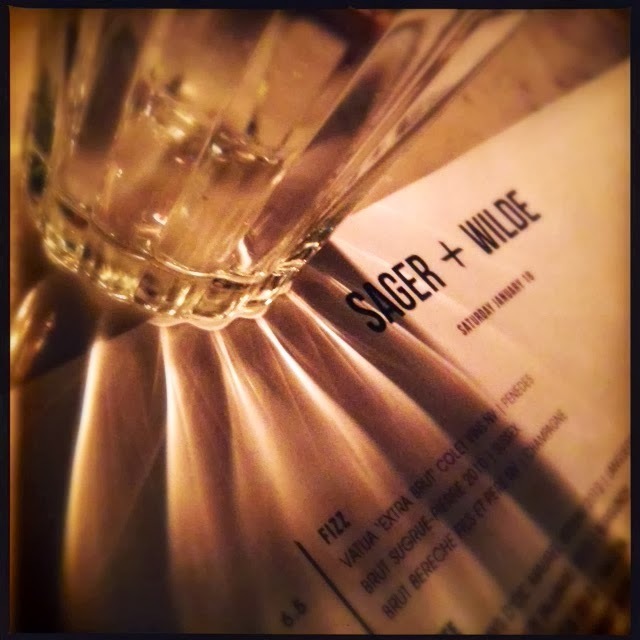 It is therefore a rare gem that can attract me across the threshold of the Borough of Tower Hamlets and Sager & Wilde is that gem. 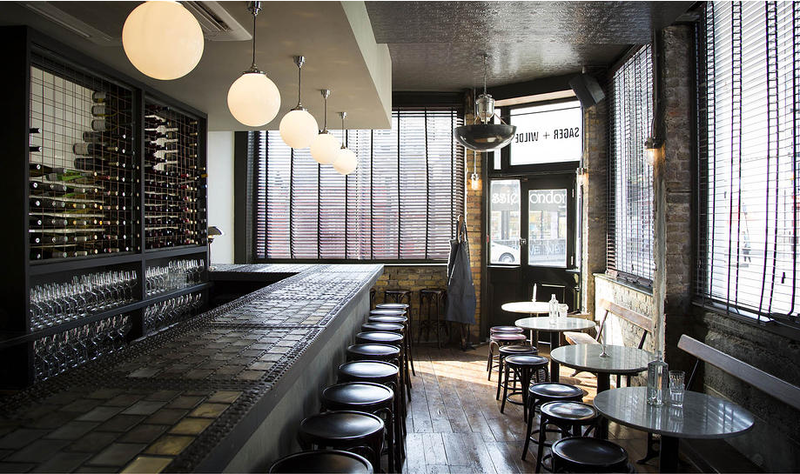 Following a former acclaimed pop-up site, Charlotte and Michael Sager- Wilde opened their eponymous wine bar in late August 2013 to a steady flow of positive press. Wine tasting buddies S, Z & A have been waxing lyrical about it for so long that I finally took a deep breath and headed East. Food is not the primary focus here but that didn’t stop all the morsels that crossed our table from being excellent. It is more about the wine though. I would challenge anyone to find a more well rounded list of wines by the glass in London. Yes, there are places that do lots by the glass but you are usually fighting your way through a tide of mediocrity to dig out a winner. Here they are all good. It is evident that each one has been selected with such care and attention that you’re unlikely to ever pick a dud. The four of us decided early on that a definite strategy was required in working our way through the list without falling over. I kicked off with a fizzy number. A sparkling Surrey Brut Sugrue Pierre 2010 was an experience. It definitely lived up to its “Brut” label being mouth numbingly dry before bursting into ripe citrus juiciness. All in all not dissimilar to sherbet and a palate enlivening start to proceedings. Considering that Swig are currently retailing it for a rather hefty £49 a bottle, £8.50 a glass seemed very reasonable indeed and you can take all wines away from S&W for a tenner less than the bar price so in this case I could have taken it home for £37. Decanter gave it 97/100 if that’s your preferred yardstick. The best adjective I could find to describe the Viognier from Francois Villard (Contours de Deponcins 2011) was ‘pretty’. That doesn’t seem like anywhere near an adequate enough description so I will try and elaborate. So fragrant with a nose and palate of white peaches and a little citrus zing followed by a fairly lengthy aftertaste reminiscent of jasmine tea. There, is that better? It was a true glugger and on a summer’s afternoon a bottle could easily disappear without pause for thought. Willi Schaefer’s 2009 Riseling Kabinett from Graacher Himmelreich was a model of a beautifully made German Riesling. The classic, tell tale – petrol/vinyl/new carpet aroma was all there (it is a good thing honestly, just go with me on this one!) and the off dry sweetness partnered with a refreshing acidity just left you wanting more, and more, and more ad infinitum. The 2008 Corton Charlemagne Grand Cru from Domaine de Montille was sumptuous in its creaminess but boasted a chilled, refined, purity of fruit. A sure fire indicator of how much I like a wine in a restaurant is whether I try and buy it for myself and a quick scan of Wine Searcher left me disappointed as I couldn’t find anywhere in the world stocking this in and only somewhere in France with the 2007 so if I want any I’m going to have to hot foot it back to S&W. Picture borrowed from S&W website as my pic was awful so copyright is theirs. Its usually lots more full. I’m at the table bottom right. Can’t see me? I’m there! Wines that I didn’t have a glass of but stole a gulp of included a very good indeed a 2004 Swartland GSM from Sequillo by Eben Sadie, a 2012 Macon from Uchizy Talmard and a 2005 Volnay from Domaine des Comtes Lafon. All were highly praised. The peak of my aforementioned ‘strategy’ was going to be a glass of 1998 Chateau d’Yquem, a snip at £14.50. Unfortunately the bottle was a bit of a dud (I felt just as bad for them as I did for me, how annoying to waste what should be such a lovely bottle) so I swapped my Yquem for a glass of Rioja Gran Reserva ‘890’ by La Rioja Alta (1998). Tasting very developed, it had moved distinctly through to secondary characters of leather and a lot of meat influences but there was certainly some life in the old dog yet and the classic characteristics of some dark cherries with a little spice thrown in were all still present. Smooth drinking but with elegant tannins, the Rioja turned out to be an excellent foil for a cheese board of Reblochon, Shropshire Blue and Comte all served with some surprising sweet but yummy cauliflower flatbreads and quince jelly. By the way, I’m absolutely NOT allowed to mention that the grilled cheese sandwiches are really both very gooey and delicious and very reasonably priced, apparently it would be best kept a secret so shhhhhhhhh! (sorry S). Also on offer are various sliced charcuterie bits and bobs and olives/nuts etc. My only criticism of the whole place would be that the red list was quite Pinot Noir heavy on the day that I went but then again I’m totally aware that I’m a minority in not appreciating its subtle charms. Oh, that and the hipster chap sat in the corner wearing a woollen, yellow hat that looked like a giant prophylactic which was a little disarming but that’s East London for you…. Will I go back? Wild horses couldn’t stop me and I’m maybe even not scared of East London any more. I’m a little bit devastated that I didn’t try the n’duja on toast though but all the more reason for an imminent return. Nice write-up, have been dying to try this place, everybody raving about it. 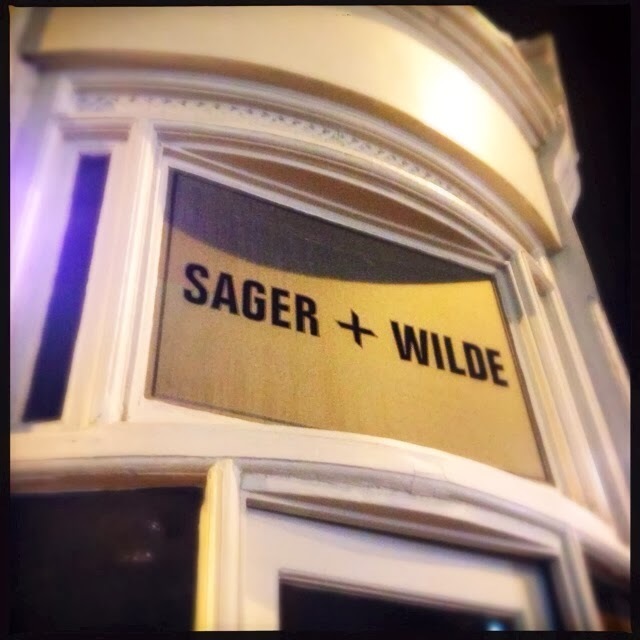 I think it is Charlotte and Michael Sager-Wilde, not Caroline. Definitely will check out next time I am in London! Thank you Mr/Miss Anon! You must definitely go, its worth a detour. Thanks also re the correction, how embarrassing! I used to know a Caroline Wilding and think I got myself all confused…. It was a marvellous afternoon/evening and you were very well behaved. I'm glad you agreed to come along with us out East and can't wait to do it again… And it isn't possible to have too much Pinot Noir on any wine list! !